What is the Checklist and when should I use it? – Hey. Ask us anything! The Checklist is really handy when you want to break down a task or an actionable item in to smaller tasks. This article explains how to create a checklist and all cool things you can do with it. Start adding to your Checklist and then click on "Update" to save. To mark your Checklist items as complete, click the circle to the left of the list item. This will check the circle and mark it green for complete. It will also cross the list item off as well. 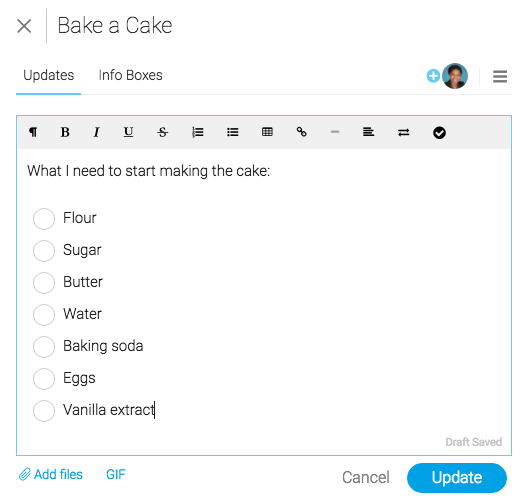 You can easily edit your checklist at anytime by clicking the drop down arrow at the top right of the update and select "edit update." Lastly, when you have created a checklist in a pulse update, you will receive this little indicator next to the name of the pulse letting you know it's there. When should I use checklists? You're almost a checklist monster! Let's now dive into when you should use checklist. Below are a couple examples of what you can do with checklists. List items needed to start a task. Let’s say you would like to bake a cake. You need to make sure you have everything you need before you can start. You can use the checklist to add a list of all the ingredients you will need, such as flour, sugar, water, eggs, etc. Check related information (from other pulses/boards). Let’s say you have a number of pulses you should check on before starting this one. Perhaps you need to make sure that your team members have completed certain tasks before you start yours. 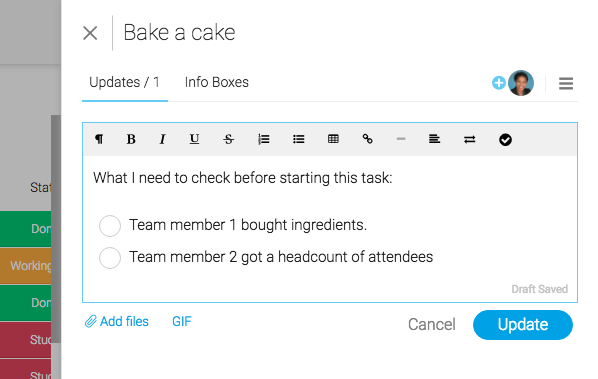 In this case, check to make sure that Team Member 1 bought the ingredients and that Team Member 2 took a headcount so you know how big the cake needs to be. If the pulses you are referencing are on different boards, it might be helpful to include the URL to the related pulse, as shown below. Tip: Learn more about our philosophy on Checklists vs Subtasks here on our blog.